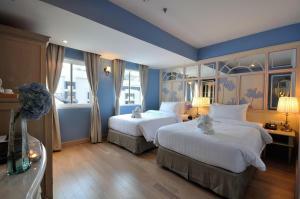 Located in the heart of Bangkok, Salil Hotel Sukhumvit Soi 11 offers modern air-conditioned rooms with free Wi-Fi. A 10-minute walk from Nana BTS Skytrain Station, the hotel has a concierge service for guests' convenience. The hotel is a 5-minute walk from the nightlife options. It is a 10-minute drive to Emporium Shopping Centre and Benjasiri Park. Suvarnabhumi Airport is a 40-minute drive from the property. Inspired by beautiful local flowers, rooms at Salil Hotel Sukhumvit 11 are furnished with colourful walls and floral motifs. Each non-smoking room comes with a satellite TV, a safety deposit box and a minibar. 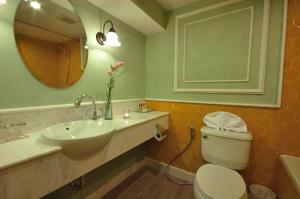 A bathtub or shower is included in an en suite bathroom. Travel arrangements can be made at the on-site tour desk while staff at the 24-hour front desk can assist guests with luggage storage and airport shuttle services. The hotel also features a business centre. Marco Eat and Drink Store serves a tasty selection of European and Thai dishes. Each unit is decorated differently follow the flower theme. This air-conditioned rooms come with a satellite TV, a safety deposit box and a minibar. A bathtub or shower is included in an en suite bathroom. Guests enjoy Salil Brand in-room amenities. Located on the 2nd floor, each unit comes with Asian flower theme. This spacious air-conditioned room offers Salil Brand amenities.There is a satellite TV, a safety deposit box and a minibar. This twin/double room features a minibar, microwave and air conditioning. This family unit is comprised of 2 connecting rooms. 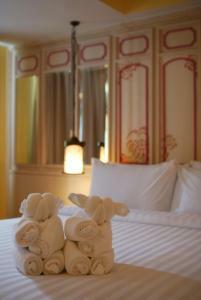 Rate: THB 1710.00 ... THB 5400.00; select dates below to get current rates.